Biomechanics is the study of the mechanical laws relating to the movement or structure of living organisms. Understanding the nature of how ones frame moves provides us an opportunity to devise ways to maximize performance while minimizing risk of injury. Each joint is designed to move in a specific manner through its range of motion. Moving athletically requires moving multiple joints and bones in conjunction with each other. Which muscles, tendons and ligaments activate and in what order will determine how we move our frames. If they activate in a manner which maintains alignment with good structural integrity throughout the movement we will have a more effective and more efficient movement with less risk of injury. If, on the other hand, we have a somewhat disconnected series of activations the movement will be less effective with poor efficiency and our risk of injury will be increased. When the muscle, tendon, and ligament strength patterns match ideal bone and joint patterns we end up with a biomechanically correct movement. Understanding biomechanically correct movement patterns for a specific activity gives us the opportunity to implement training modalities to develop ourselves in ways which are safer, more efficient and more effective. We offer bio-mechanically correct training that has been scientifically tested and competition proven. As well as being counterproductive, it is NOT necessary to get a black eye, broken nose, or any other injury to learn the fundamentals of proper fighting skills. We have a systematized approach to develop the mechanics required for powerful hitting, solid defensive techniques, and practical movement. Once this foundation has been laid, we then teach logical and appropriate strategies for the application of these skills. This is all done in a hands on environment where each student is progressed step by step at their own pace and proficiency level to ensure safety and proper development. Are knock-out artists born or made? Accurately transferring energy to a target is a skill that ANYONE can learn providing they have the right coaching. Learn to hit with POWER regardless of gender, size or age. Develop practical defensive fundamentals like catching, parrying, redirecting and leverage stopping. Learn to slip, weave, shuffle and float, as well as practical strategies for applying these techniques. FITNESS BOXING - Train just like a competitive Boxer short of sparring and getting hit! This is safe, fantastic conditioning! GROUP AND PRIVATE TRAINING for personal fitness as well as competitive Boxing for amateur and professional athletes is available at your location or our Sanford Airport location. Instructors can also be available to set up customized Boxing seminars at your location. The national sport of Thailand is both a ring sport and a fighting science. Known as the art of eight limbs, Muay Thai utilizes punches, kicks, powerful knee and devastating elbow strikes. Its trademark, the Muay Thai Shin Kick, is known to be the most devastating of all kicks. In Muay Thai, strikes are allowed from head to toe and, in contrast to Western Boxing, holding and hitting is both allowed and encouraged. KICKBOXING FITNESS TRAINING – Highly cardiovascular! Bring a towel – you will SWEAT! Learn biomechanically correct striking as well as practical defensive techniques. Learn everything the competitive Muay Thai fighters learn short of sparring and getting hit. It’s fitness that WORKS! GROUP AND PRIVATE TRAINING for personal fitness as well as competitive Muay Thai for amateur and professional athletes is available at your location as well as our Sanford Airport location. Instructors can also be available to set up customized Muay Thai seminars at your location. Similar to modern wrestling, we train you to control your opponent then we go to the next step - submitting your opponent. We’ll train you to apply as well as defend joint locks, breaks, chokes, etc. The emphasis in Submission Grappling is on controlling and ultimately submitting your opponent through the use of positioning and leverage, regardless of whether you are above, below, or to the side of your opponent. Submission Grappling is not just for BIG guys. Even on a much larger opponent, small men and women can be devastatingly effective when implementing these techniques. This is practical training for real world situations. GROUP AND PRIVATE TRAINING for personal fitness as well as competitive Submission Grappling is available at your location or our Sanford Airport location. Instructors can also be available to set up customized Submission Grappling seminars at your location. Learn how to FIGHT standing up and on the ground! Seamlessly integrate Boxing and Muay Thai with Submission Grappling and you have what Sports Illustrated has labeled “America’s Fastest Growing and Most Controversial Sport.” In MMA crossover of technique application is the name of the game. In addition to their traditional applications, we will also train you to strike on the ground as well as apply submissions from secure standing positions. This is functional training at its best! GROUP AND PRIVATE TRAINING for personal fitness as well as competitive MMA for both amateur and professional athletes is available at your location or our Sanford Airport location. 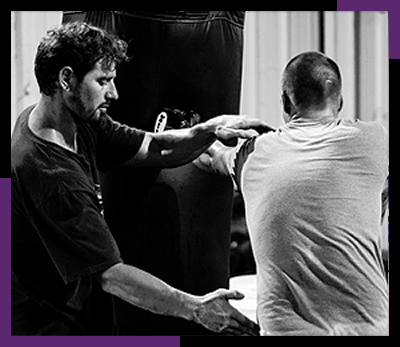 Instructors can also be available to set up customized MMA seminars at your location. 1 on 1 PERSONAL TRAINING caters to YOUR specific needs to accomplish YOUR goals. NOTHING beats having the guidance and unique insight of a qualified instructor, with a meticulous eye, who can customize every aspect of your training and has your best interest at heart. Be it weight loss or gain, developing strength, endurance, increasing your mobility, improving your fighting technique, conditioning for a specific sport, competition preparation or an endless array of other desired results an experienced, well trained professional instructor can provide you with the tools to achieve YOUR goals. PRIVATE TRAINING is available by appointment at your location, our Sanford Airport location, or at one of our local partnering facilities in Altamonte Springs and Oviedo. Instructors can also be available to set up customized seminars and/or personalized training for small groups at your location. For those not able to come to one of our local facilities, yet still want to take advantage of our exceptional training, we now offer LIVE ONLINE TRAINING!!! At Kokopelli's Gym we train both amateur and professional athletes as well as those just looking for self defense and/or functional fitness training. We offer bio-mechanically correct training that has been scientifically tested and competition proven. We take pride in ensuring that ALL of our students develop solid fundamentals in the discipline(s) of their choice. Refreshingly, for those just wanting to get in shape, competing is NOT a requirement to receive professional competition level training and instruction at Kokopelli’s Gym. Whether you are looking for a safe and comfortable environment for personal fitness training, a premium facility to prepare for your next fight, or the instruction necessary to become an amateur or professional fighter THIS IS THE PLACE! © Copyright 2016 All Rights Reserved. Kokopelli's Gym Inc.